Taking over a grand townhouse dating back to the '80s, this photogenic cafe on the backstreets of Sathorn also hosts ceramics workshops. Order dirt-cheap coffee (B40-55) and light bites like the classic raspberry muffin (B30). This superfood cafe launched by the owner of popular health and wellness guide Ms Happy Diet serves smoothie bowls made from frozen acai pulp instead of powdered acai. For chocoholics, try The Unstoppabowl (B165) topped with house-made chocolate sauce. The oh-so-trendy coffee chain unveils their largest branch yet. The all-day breakfast menu offers crowd-pleasers like the sourdough croque madame (B220), while beyond the single-origin brews there are also beers and cocktails. The latest dessert cafe in Chatuchak dips into its Thai roots by serving a line of bite-sized, flavor-packed Thai treats such as kanom gluay (B15) and kanom pra pai (B80). This kiosk is a tea lover's dream: the basic cold-brew teas (B135) come packed with 24 hours’ worth of fresh-fruit-macerated flavor, while the decadent chocolate, cream cheese, caramel and sea-salt tea (B135) is like liquid dessert in a cup. The second branch of Sala Daeng's hit nitro coffee shop looks more bar than cafe thanks to a long marble counter lined with six nitro taps. As before, expect Thai twists on signature cold nitro brew like the Kai Kem Latte (B140). Greyhound’s latest outpost in Ekkamai adds a new sub-brand to the fashion empire. Sharing the space with a Honda big bike showroom, the cafe befits the motor theme with novelty signature nitro drinks like the House of Super Cub (B185). Grab a Super Dog (B220) for a quick snack. Calling all avocado fans! This earthy cafe has an all-day-dining menu dedicated to the creamy green fruit. Their Hass avocados are shipped from New Zealand and are served in every imaginable form and flavor from deep-fried (B240) to smoothie (B155). Bangkok's first bean-to-bar chocolate cafe shows off organic cacao from around Thailand in a range of drinks and desserts. The Old Town's dessert bar celebrates hard-to-find Thai treats like krong krang (B50) in a laid-back space. New Mexico coffee culture comes to Udom Suk with a picturesque setting. American co-owners Gary and Michelle Ford hwhip out creative offerings like the Snickers-flavored affogato (B180) and spicy orange mocha (B140). This sweet-smelling bread house in Ari claims ties with Austrian pastry powerhouse Gragger & Cie. Enjoy the Austrian classic cheese bread stick (B40) with a frothy cappuccino (B70). Sathorn's brunch favourite arrives in Thonglor. Have your breakfast burrito (B310) and "Gangnam style" waffle (B270) while lusting over retro-style big bikes thanks to its collaboration with BMW. Asoke's Makai opens a second branch in Sathorn to serve their signature acai bowls (B160/260) and many more healthy shakes to gym enthusiasts and health-conscious office workers alike. Soi Nana’s newcomer brings nightlife’s speakeasy-cool to coffee. A spiral staircase will take you to where award-winning barista Warong Chalanuchpong serves up his signature drinks. Following the success of their Thonglor branch at The Commons, Roots has opened another joint right beside BTS Surasak. 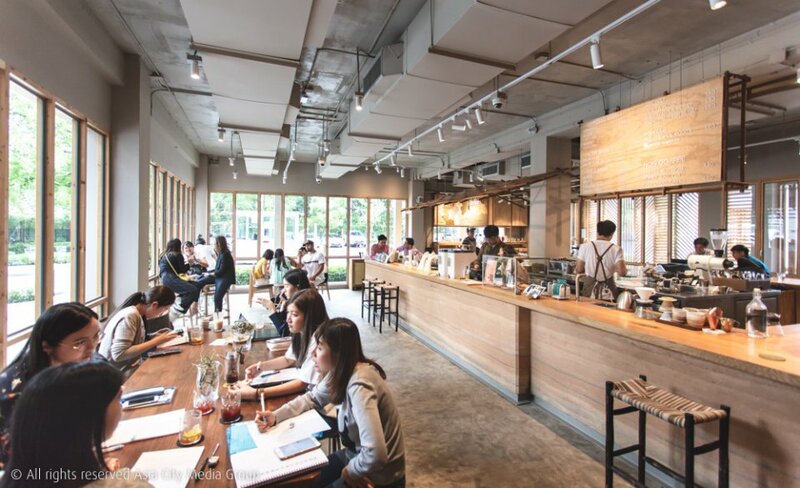 Here, coffee snobs can get their fill of fruity cold brews and coffee shakes, with beans sourced from the north of Thailand—you can even write on a postcard with a message for their farmers. Sathorn welcomes a dog-friendly cafe in the cutest of Japanese style. Bring your four legged friend to play around in a garden while you have lemon meringue tart (B150) with a cup of caramel macchiato (B120). Sathorn’s secretive new cafe whips out floral creations to match the photogenic setting—try the Peanut Butter Coffee (B135) or Matchalicious (B135).